In New York I have had the good fortune to see both the original Broadway production and the later Broadway revival of Jerry Herman’s groundbreaking musical, “La Cage Aux Folles.” Those productions skillfully combined the fine music and lyrics of Mr. Herman with the often-zany comedy of the amusing book by Harvey Fierstein. Centered in the world of a drag queen nightclub (The French “La Cage Aux Folles” translates as “The Bird Cage”) the comedy was full of campy hilarity that was measured in a way so as not to become annoying. That trick was not successfully replicated in the current national tour being presented by Theatre Under the Stars at Houston’s Hobby Center. That is not to say that this touring production (starring film star, George Hamilton) was entirely without merit. Directed by Terry Johnson, it had success on various levels and did send the audience out smiling at the close. But, in fact, it could have had so much more to offer. Even before the show proper began, the proceedings opened merrily as one of “Les Girls” stepped forward alone on the stage to warm up the audience with what could aptly be called gay and playful banter. If this were a stalling tactic because so many patrons were delayed in unusual downtown Houston traffic snarls on the night of my attendance, I would say the tactic created one of the most hilarious parts of the evening and had the audience in stitches. Then, at last, it was show time and we were off to the cabaret world of St. Tropez, France. 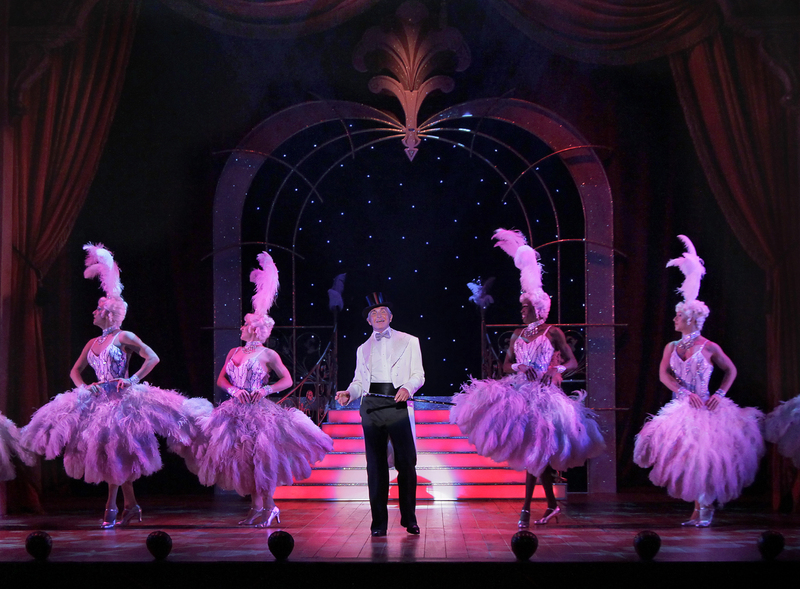 Blood-red lighting (designer, Nick Richings) cast dramatic black silhouettes of the club’s half-dozen showgirls known as the Cagelles. Gentlemen all, this group brings much of the spirited fun to La Cage, and whether doing an acrobatic ballet in a birdcage or a feisty Can-Can (choreographer, Lynne Page), they all sparkle in the glitzy costume designs of Matthew Wright. Mr. Hamilton’s character, Georges, is Emcee at the nightclub, and his longtime gay lover, Albin (Christopher Sieber) is a temperamental and aging drag queen that stars in the show. This is where the problems began. 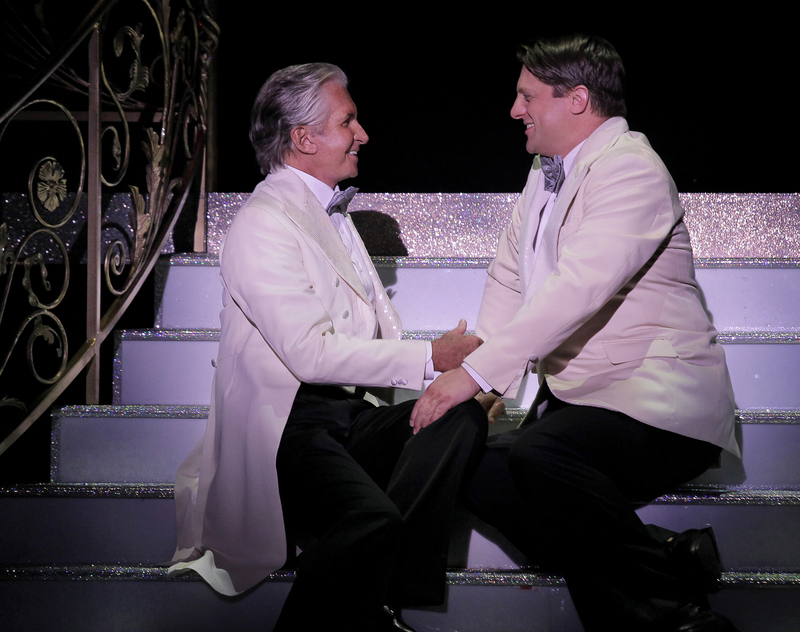 Sieber’s performance as Albin is so one-dimensionally and outlandishly gay that much of the time he becomes essentially a hysterically campy cartoon character that one could never imagine having a meaningfully tender and loving relationship with the smoothly elegant Georges. 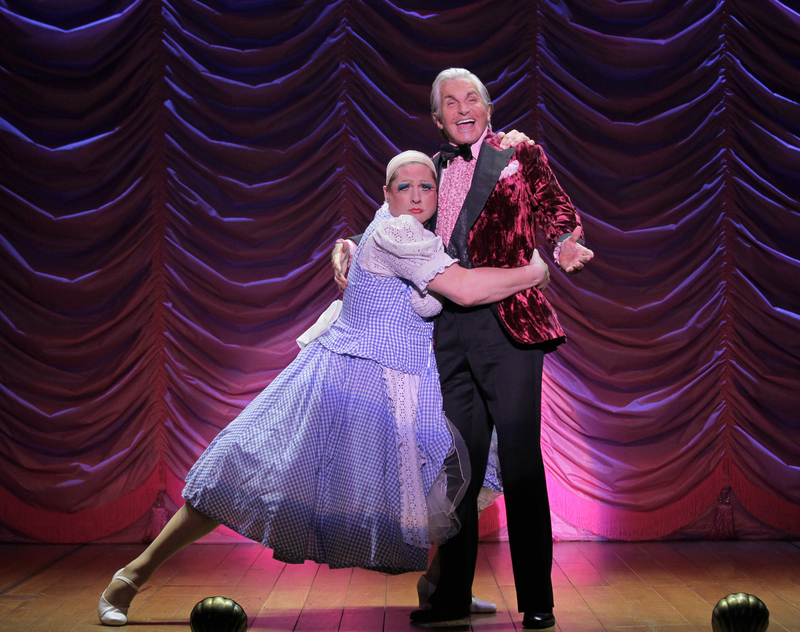 Sieber sometimes seemed to be aping the feminine mannerisms of the late Paul Lynde, but before Act One ends he does lead the cast in a lusty and snarling rendition of the show’s title tune. Better still, he tones down the camp with a diva moment for the fiercely solid, “I Am What I Am,” that takes the show to intermission. Meanwhile, with lushly silvered hair and wide smile, the endlessly handsome Mr. Hamilton certainly lives up to his occasional nickname: “Teeth & Tan.” And I know where he got some of that tan, having met the glamorously golden-brown gent some 30 years ago at the Malaga airport on the Mediterranean sun coast of Spain known as La Costa del Sol. Hamilton’s cheerful performance as Georges was understated and had no fire in the belly, but he did look marvelous whether beaming in a wine velvet tuxedo or formal white tails. While singing is certainly not his forte, he did have some pleasant vocal moments for a duet of “Anne on My Arm” with young Michael Lowney who plays Georges’ son, Jean-Michel. The “straight” Jean-Michel shocks his gay dad with the news that he plans to wed the lovely Anne (Allison Blair McDowell), who just happens to be daughter of Monsieur Dindon (Bernard Burak Sheredy), the head of the anti-gay and arch conservative “Tradition, Family and Morality Party.” The fun begins to crank up when M. Dindon and his wife (Cathy Newman) are invited to come for a visit and meet the parents of the groom. It is safe to say that all hell breaks loose, but alas the very campy character of Georges’ butler, Jacob (Jeigh Madjus) gives us another example of heavy handed comedy that is wildly overdone. The role of Jacob is supposed to be outrageous and should be one of the funniest in the play, but in the hands of Madjus it became instead another example of annoying excess. Finally, in Act Two we see the seeds of a genuine loving relationship between Albin and Georges in their mellow and sweet duet of “Song of the Sand.” In preparation to meet the Dindon family, Albin gets some amusing how-to-be-macho lessons during the cute ensemble number, “Masculinity.” Hamilton has another vocal success with a tender and reflective, “Look Over There,” and when a hilarious ending proves that “all’s well that ends well,” there is the sensational joy of the show’s anthem, “The Best of Times is Now.” A smiling audience seemed to agree. LA CAGE AUX FOLLES continues at the Houston Hobby Center with performances Tuesday through Thursday at 7:30 pm, Friday & Saturday at 8 pm, matinees Saturday & Sunday at 2 pm, and a final performance next Sunday night at 7:30 pm. For tickets & information call 713-558-8887 or visit the website at: www.TUTS.com . This entry was posted in Broadway, BroadwayStars.com, Miscellaneous Reviews, Nightclubs, Theater Reviews, ThePeoplesCritic.com and tagged Broadway, Celebrities, Entertainment, Houston, La Cage Aux Folles, music, musicals, New York, nightclubs, plays, Reviews, Texas, theatre. Bookmark the permalink.